I will admit that one of the perks of living in the National Capital area is we have access to the metropolitan life whenever we want it. I will also admit that being a commuter and driving 50 miles each way to work every day doesn’t have me chomping at the bit to run into the city on my weekend. I imagine that if I were a younger man in a relationship trying to impress a girl the capital city is made for it, and in September after the August heat has dissipated is the best time of year for a visit. I mi ght start this date early Saturday afternoon by strolling by the National Zoo to take in the new American Trail exibit. The best part is the zoo (like all the Smithsonian Museums) is free to the public. 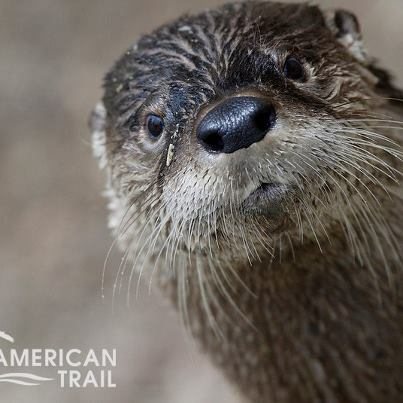 You can show your date that you’re sensitive by awing at the baby animals and funny by imitiating the seals as the new trail brings you face to face with sea lions, otters and eagles showcasing North American wildlife. The zoo considers many of the animals on display “conservation success stories” as they have found their way back from near extinction. You can even soak your feet in the cool water of a man-made tidal pool. If you want to show your date you’re sophisticated, too, so I’d suggest seeing a show, and I ain’t talking Mama Mia. The Folgers Shakespeare Library is more than a repository of old folios and plays by the bard. It’s a place where the works of arguably the greatest playwright in history are preformed. The theater will be hosting the London-based Shakespeare’s Globe Theater Company and their stripped-down Hamlet. The small cast condenses the long play about the mad prince of Denmark into only two and a half hours. The performances run through the 22nd of September; call 202.544.7077 for tickets. If all of the walking around has made you thirsty, head downtown to the Hotel W’s roof-top bar for one of the most unique views of the city. You’ll amaze your date by seeming the Washington insider as you whisk her up to this 11th floor terrace bar filled with soft couches and chairs that let you relax in style. 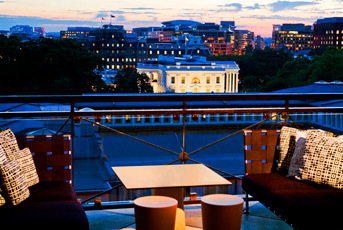 The hotel is located near the White House and lets you sip drinks in the shade and look down on Lafayette Park, the Ellipse, the White House and the National Mall. I would make reservations though; they fill up fast especially at lunch and in the early evening hours. You can use opentable.com or call 202.661.2452. You might be getting hungry by now after your afternoon of walking and need something more substantial in your stomach than cocktail nuts. I have to make a big disclosure at this point; I can’t remember the last time that I had a meal at a DC restaurant. I drive in and out of the city and seldom have time for a proper meal. The last restaurant-style meal I had was at Ben’s Chili Bowl, a DC institution specializing in chili dogs. So, to find a meal that pleases your date my best recommendation for finding a restaurant for a nice sit down meal is checking out the Washington Post Best Eats list. The leading DC newspaper’s list is easy to search and breaks down restaurants into cuisine, cost and location. I’d trust their reviews and you’re sure to find something that matches your palate. Remember, if you choose Italian food my sister says two garlics cancel each other out. If you’re from out of town and are looking for luxury on a budget I suggest staying across the Key Bridge in Virginia in the Rosslyn neighborhood. The business-centric neighborhood with views of Georgetown is crawling with federal workers and contractors during the week and empties out on the weekend, which makes the hotel rates more reasonable. The neighborhood also has a metro stop, so you can ride the rails into the city and leave your car in the hotel parking deck. 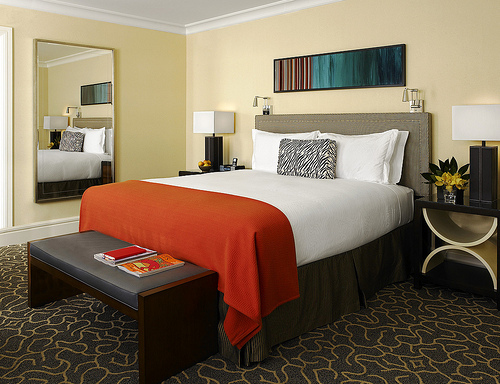 I suggest staying at the Le Meridien, Arlington. I’ve stayed there in the past and the contemporary hotel is stylish and modern. When we were there they had nightly complementary wine tastings in the lounge. The service was excellent and the room was spacious. I also bet you’ll get a kick out of the leopard print robes in the closet. Search for them on Hotels.com or give them a call at 202.661.2452 for rooms at about $100-150 a night. If you’re looking for something to do this fall and live in the metro area or you’re planning a weekend getaway with a special someone in mind, consider the nation’s capital. It’s the home of our political leaders — but don’t let that put you off — they won’t be in town, they’re too busy campaigning.